About a week ago, I left my building to go to work, walked about 15 feet and was stopped dead in my tracks by this loom that was sitting on the sidewalk with the trash and recycling. One of the things I both love and hate about New York is the crazy stuff that people throw out. Back in the 90’s, over 75% of the furniture in our apartment was picked off the sidewalk -and some of it was really amazing. But this topped it all! I picked it up and promptly went back to my apartment. For a few minutes, I just sat there looking at it – dusty, but otherwise in perfect shape – marveling at my good fortune. The event was startling because I had recently been thinking about whether or not to look for a loom. It has been over 15 years since I have woven anything, but I spent many hours of my college years in the fiber arts department. 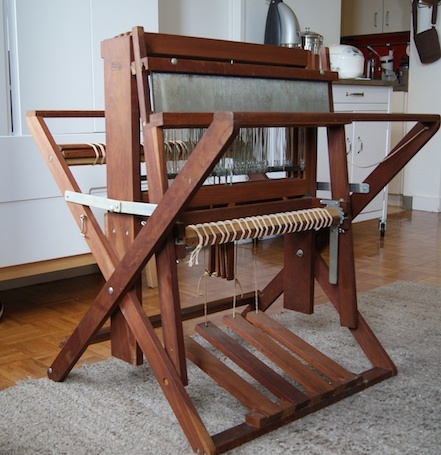 My courtship with my husband played out over the warping of a particularly large loom, and his willingness to help with the tedium of that exercise showed me that it was for real. But in those peripatetic years post-college and beyond, there was no room for weaving. Until now. The sudden appearance of this beautiful object makes me feel obligated to do something with it, but what? It’s a unique form of stress. 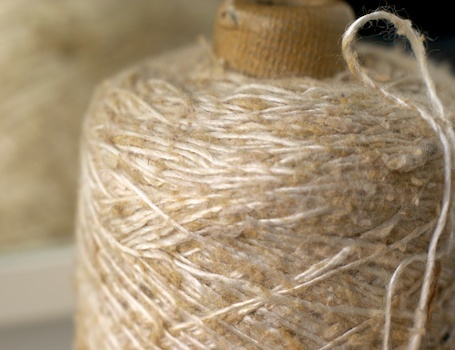 Luckily, I still have some of the yarn from my former weaving days – having moved it from place to place hoping that it would be put to use again. This entry was posted on January 29, 2012, 8:28 am and is filed under make. You can follow any responses to this entry through RSS 2.0. You can leave a response, or trackback from your own site. This reminds me of the time I was riding south on the 101 through Sonoma County and the motor of the old funky Volkswagen bug died on the freeway. We coasted down the next off-ramp and rolled through two right turns. As we came to a stop the driver Dave said “I know what the problem is. I need a crescent wrench but I left mine at home.” We got out of the car and saw a crescent wrench perfect for the job lying in the gutter right next to the car’s rear end. Dave grabbed the tool, worked some magic, and one minute later we were ambling down the road. My point is, this is the perfect time and place for you to stumble on this piece of equipment. This loom can become the centrepiece of a local community program to bring both adults and kids into the world of artwork. Beautiful photos! Ur shallow depth of field skills r perfecto! I believe that we create everything in perfect timing. You now finally had the time and space to start weaving again, so therefore you started thinking and focusing on wanting a loom. The Universe heard your thoughts, and found someone who no longer needed theirs, so they set it out for you to find. I have to admit they probably did not think that they were setting it for you, but they did so anyways. I love how the Universe works. I too use to weave, and I actually took a degree in Fashion design. I interned under a fiber artist in the small town I am from. 10 miles from where I live right now. Interestingly enough, weaving is the farthest from my mind right now! Just the thought of warping a loom… Haha! Someday I will return to my love of spinning and weaving! This is such an incredible find! I look forward to seeing what you make with it. A similar thing happened to me. I was talking with some friends about setting up a book arts studio; over the course of the next two weeks I find a guillotine paper cutter and a book press, each sitting outside, abandoned and neglected! It’s actually what inspired me to start me blog. I look forward to see where this find will take you! Now the cello and violin won’t be lonely. May you and your new friend spend many happy hours together. Looking forward to seeing it next month. Wow, I have found some cool trash in my life but this is truly amazing! And what a sweet story about your husband. 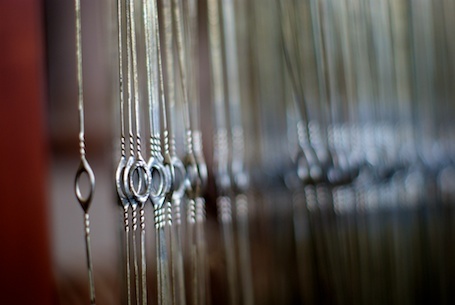 Weaving is one of the most beautiful handcrafts in the world, imho, I hope you enjoy your rediscovery of it. What a wonderful find. May you spend many happy hours with it.